Last weekend, we enjoyed the company of a very special friend with her family! She kept ordering all the time not to make anything that takes high efforts… And I obeyed her orders! Prepared “Brijwasi Chat Platter”, which traditionally includes Aloo Tikki or Samosa with a spicy and tangy chickpeas curry to be served with 2 different chutneys! – Take hot water in a bowl and keep spinach leaves in it for 2-3 mins. – Drain and keep them in a bowl full of ice water for a few mins to retain its original green color. 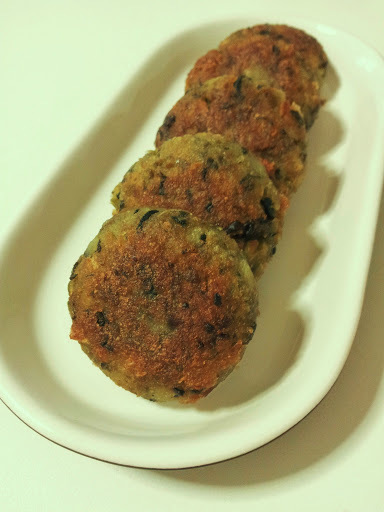 – In a mixture jar, add spinach, coriander, mint, fenugreek leaves and grind to make coarse paste. – Take boiled potatoes in a big bowl and mash them well. Mix green peas but do not crush it completely. – Add greens paste, cornflour, bread crumbs and all the spices. – Mix all well and make 8 round tikkis out of it. – Heat some oil on a flat pan. Shallow fry all the tikkis till crispy golden brown on both the sides. – Serve hot with Green Chutney or chilled yogurt! 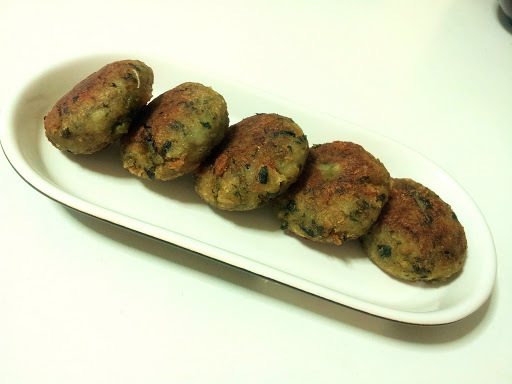 – While serving, add few drops of lemon juice and sprinkle chat masala over all the kebabs. – Works perfect if fresh fenugreek leaves are used. If not, use 1/2 kasoori methi instead.